Hi guys! This week has been flying by, and it'll be the weekend before you know it. I'll be doing a little traveling next week, so who knows what the blog schedule will be. 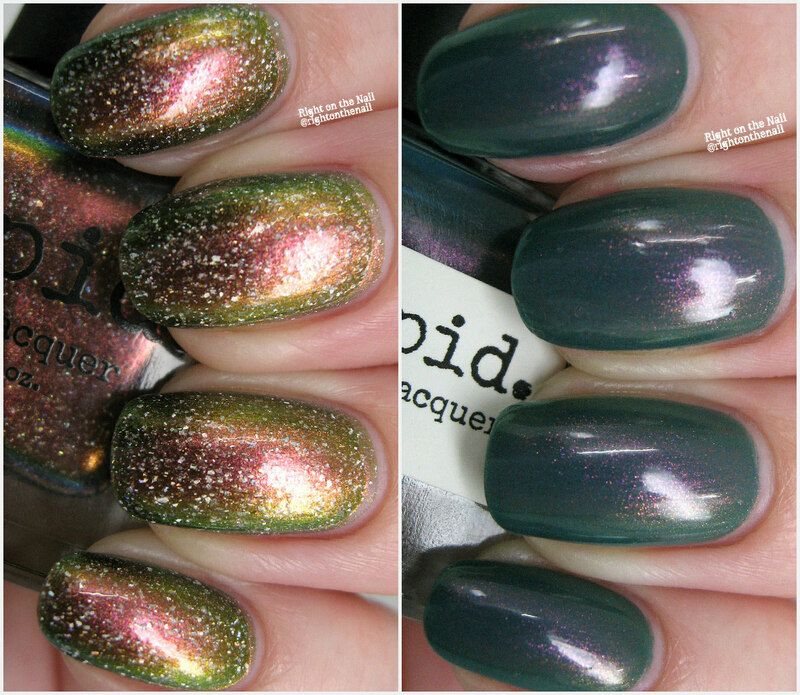 Tonight I have a couple random polishes from Vapid Lacquer that I bought during the annual Purge. I bought more bath and body products than polishes, so I think I have just one more to show you at some point. Neither of these are currently for sale, but February is the maker's birthday month, so there are usually some new goodies that make their way back to the website. I highly recommend you join the Vapid Lacquer Facebook Group (Vapicorns) to get the most up-to-date info about the company and releases. Swatch time! Up first we have the "dirty" version of Crab Nebula which is a burgundy/bronze/green shifter with some blue that only shows up in the bottle shot. The holo flakes are what makes this the "dirty version." The formula was perfect in just 2 coats, and it dried with very little texture even with the flakes. Waxing Poetic is a teal base with pink/bronze/green shimmer. While I love both polishes, this one is my top pick. You know I love contrasting shimmers, and this one does not disappoint. The formula was great, and I needed 3 thinner coats for full coverage. You could likely get away with 2 coats, but I wanted that extra depth for photos. Again, these aren't for sale right now, but will likely be rereleased in the near future.